India’s governing Bharatiya Janata Party’s MLA Bheema Mandavi was among five people killed in a suspected Maoist attack on his convoy in Dantewada district of Chhattisgarh, days before the state votes in general elections on 11 April. P Sundar Raj, the deputy inspector general for anti-Maoist operations, stated that four policemen and MLA’s drivers were also killed while MLA was returning from a campaign appearance. However, MLA Bheema Mandavi’s body initially remained untraced. The Naxalites blew up an SUV in the convoy with an improvised explosive device and opened fire at the occupants. The incident took place at Shyamagiri hills when Mandavi’s convoy was heading towards Kuwakonda from Bacheli area. Chhattisgarh Chief Minister Bhupesh Baghel has ordered a high-level meeting after the attack. The MLA’s SUV despite being a bullet-proof vehicle was blown into pieces. The police agencies had advised the MLAs not to tour the Maoist-infested area based on specific intelligence inputs. The Election Commission has demanded an “immediate” report from the Chhattisgarh government and the poll authorities on the Naxal attack in the state’s Dantewada district. In a separate attack, unknown gunmen burst into a hospital in Jammu and Kashmir and killed Chandrakant Sharma, a regional leader of a Hindu group linked to the BJP, along with his bodyguard. India’s general elections, the biggest democratic exercise in the world, get underway in April 2019 and will determine the leadership and direction of the country of 1.3 billion for the next five years. The debate among the experts and voters as who will form the next government is a heated one. It is important that the democratic exercise of elections be peaceful. It seems that in this election it’s not just about the Parliamentary seats that are at stake, it seems like the safety of politicians is also endangered by forces of violence across the nation. Many different groups use terror as a tool in India, including separatist movements in the northeast, rural Maoists called Naxalites in the center and east of the country. The Naxalites are a hardened group which has been terrorizing India for decades. The US considers Naxalites as a third most terror organization in the world, after ISIS and the Taliban. Journalists, CRPF personnel, Ministers and local villages have been on the hit-list of this radical group for years. 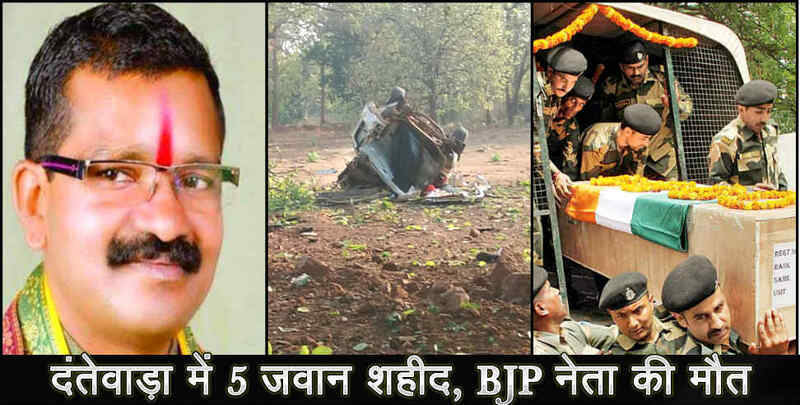 Last year, when India prepared for Assembly polls in Chhattisgarh, Naxalites blew up a vehicle carrying 1 security personnel, 4 civilians and injured several others in Dantewada District. Naxalites groups control vast territories in many prominent states of eastern India- particularly, Andhra Pradesh, Bihar, Chhattisgarh, Jharkhand, Orissa and West Bengal- and their influence has spread even wider beyond those areas and the fear to the parliament. How will Election Commission conduct upcoming general elections in such hostile states? National and state governments consistently have labeled Naxalite groups as terrorist organizations and proclaimed them to be illegal but for decades they haven’t found perfect ammunition to defeat them. Former Indian Prime Minister Manmohan Singh declared Naxalism the single biggest internal security challenge ever faced by India. Indian government under Narendra Modi supervision has spent millions of dollars to curb the menace and bring an end this era of terror. Naxalites retaliate these strategies by attacking BJP ministers, journalists and remain the biggest threat to national security and the upcoming election. Should we wait to count how many more would die before the election or use the perfect investigative tools to eliminate terrorism? The lack of accurate information about the locations and plans of Naxalites is the biggest hurdle encountered by Indian law enforcement forces for decades. Their attacks always come as a surprise and cause maximum causalities. CRPF and other law enforcement agencies have tried bullets, even used existing conventional investigative tools to gain accurate, confidential information from innocent locals or arrested Naxalites but neither has weakened the group enough that it does not pose a serious threat. National Security experts believe if the government stays on the offensive with the right tools and wait for the perfect window then it could lead to success by eliminating this significant threat within a few months rather than decades. With the limited time left for India’s governing Bharatiya Janata Party to make a powerful impact on the voters. Pre-emptive actions against Naxalites would be the perfect example to set up and ensure the Indian citizenry the capabilities the current administration has to deal with anti-social forces within the country. Don’t treat the symptom, treat the root cause of the problem. Internal Security is very important for citizens of any country and it must be addressed at the earliest by the government and the law enforcement agencies. Indian law enforcement agencies need to act quickly with the right tools to identify the root cause of the problem and eliminate it. It is a perfect time for law enforcement personnel to elevate the existing technologies that fall short of their goals and make room for an advanced neuroscience-based technology capable enough to reveal the concealed crime-related information from Naxalites’ brain and helps provide substantial evidence thereby leading to identification of hideout locations and future attack plans of this hideous terror group. A highly advanced security solution that can directly match crime-related information directly from the brain of an individual with nearly perfect accuracy is iCognative, designed and developed by US-based company Brainwave Science. Developed in close collaboration and at the guidance of experts in the field of counter-terrorism, counter-intelligence, national security experts from the US, iCognative is the sole technology in the security market that can provide the perfect window for Indian law enforcement agencies to strike a deadly blow against Naxalism and eliminate them within a month. Indian experts believe in order to turn the tide, the Indian government and law enforcement agencies will take much time, effort and money. The odds of that happening in the next 20 years is limited. So, what solution does the current BJP led government along with the law enforcement agencies have? iCognative by Brainwave Science is best-suited forensic and scientific technology that can guarantee immediate result with an assurance that no innocent would suffer. iCognative is a truly disruptive technology that helps identify the perpetrator from an innocent and further reveals what specific crime-related information he/she possesses with over 99% accuracy. Such accuracy and results cannot be guaranteed by any other investigative technology as iCognative. It is a fully automated technology, relies only on the reactions from the human brain which cannot be consciously controlled by the perpetrator, thus by default, false positive and false negatives are eliminated. Chances of human error, in terms of perpetrator or investigator, is minimized to zero. Indian law enforcement agencies including Chhattisgarh police must utilize the benefits afforded by iCognative technology in such crucial cases where lack of accurate information about the locations and plans of Naxalites is the biggest hurdle encountered by the Indian law enforcement forces for decades. In this case, all the necessary crime-related information could be accessible and verified with almost perfect accuracy once a 45-minutes to an hour iCognative test is conducted by law enforcement personnel on detained Naxalites or local helper of Naxalites. Information such as: camps of Naxalites, identification of mastermind behind such attacks, identification of other known or unknown Naxalites members, how they obtained bombs, ammunition, identification of handlers, financial details, details of future attacks, who would be the next target, etc., would be easily available to Indian law enforcement personnel to investigate this case and further use the information obtained from iCognative to reverse-engineer and identify the mastermind and eliminate Naxalites within days without investing times, effort and money to turn the tide. Details related to a case at hand are uploaded by a case officer or an investigative team member into the iCognative system. Investigating this case using iCognative technology enables law enforcement personnel to verify the testimonies and determine what specific crime-related information suspect possesses by analyzing the pattern of a specific brain response called the P300. iCognative makes sure that innocent and perpetrator are recognized within an hour without any violation of human rights. Brainwave Science developed and designed iCognative as a user-friendly technology so any investigating officer can operate it without the necessity of specific knowledge or skills. Narendra Modi government formulated a new Anti-Naxal Policy which focused on counterinsurgency with more firepower and zero tolerance. Maybe it’s time for Indian government and law enforcement agencies to consider alternatives when the present policies and strategies cannot provide desired results. Brainwave Science’s iCognative harkens in a whole new era of heightened security and accurate intelligence gathering.